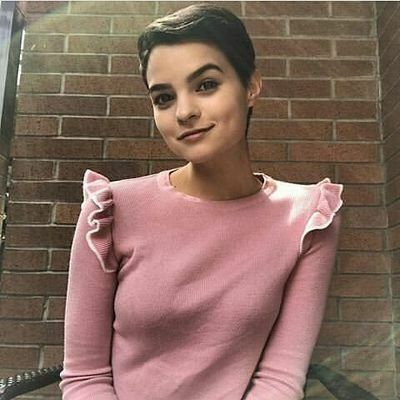 Brianna Hildebrand is an American actress. She gained recognition through appearing in the web series Annie Undocumented. She played Negasonic Teenage Warhead in the Marvel film Deadpool and its sequel Deadpool 2. She is also known for her role as Sadie Cunningham in the 2017 film Tragedy Girls. For her work in Deadpool, she was nominated for Teen Choice Awards in the category Choice Movie: Breakout Star. Born Brianna Caitlin Hildebrand on August 14, 1996 in College Station, Texas, USA, to Veronica and Caleb Hildebrand, she belongs to German, English, Irish, and Mexican descent. She was educated at A&M Consolidated High School. She made her film debut in Prism (2015). In 2016, she began dating Jonneke Grisham. *She was born in College Station, Texas, USA on August 14, 1996. *She was cast as Julia in the 2015 film Prism, alongside Even Stevens star Christy Carlson Romano. *She appeared alongside Dylan Gelula and Mateo Arias in the 2016 film the First Girl I Loved.